The Leonisa Promotion is on with 25% off on sales items e.g. bras, knickers, shapewear, swimmwear. 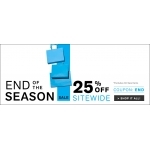 Shop online with promo code: "END". Free UK delivery on all orders over £60. The promotion is valid online and in stores untill 31 August 2016.